Travis Laplante's new band couldn't have come up with a better name for the debut if they tried. If you are familiar with Travis Laplante as a member of the noise-jazz collective Little Women, then prepare to chase that idea even further. 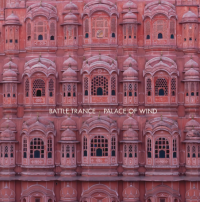 Palace of Wind is the first album by Laplante’s new saxophone quartet Battle Trance. They likely share key common goals with Little Women, stretching musical forms to their breaking point in order to find something cool. But Battle Trance are even more abstract than that. Laplante, along with Jeremy Viner, Matthew Nelson, and Patrick Breiner, make the most of their circular breathing skills and fluttering tongues to set the scene on the first movement (Palace of Wind is made up of three untitled tracks). If you keep the volume low enough, it almost doesn’t sound like a saxophone quartet. Their harmonies can be soft and serene you may think it's a church organ or a long lost Brian Eno album. My Windows Media Player at work went so far as to classify Palace of Wind as "Classical". I'm in no mood to argue against that. Besides, it's to the credit of everyone involved that an album made with just four saxophones won't bore you. Palace of Wind isn't just superb music, it's a reminder you can sometimes accomplish much more with far, far less.